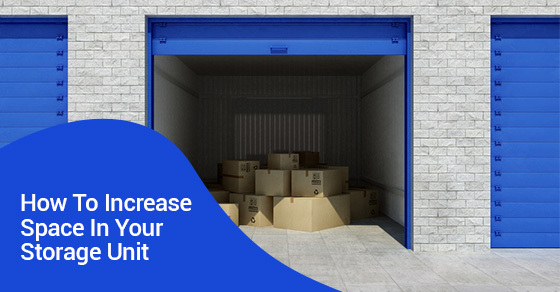 A self storage unit can greatly improve your quality of life by providing extra space around the home or office, helping you declutter, and increasing your sense of order. But simply investing in a self storage unit does not necessarily mean you are going to get the most out of it. To do that, you need to know how to maximize your space. Below are four DIY tricks to increase space in your storage unit. Most people don’t get the most out of their storage unit because they don’t know how to maximize vertical space. Things are strewn all over the floor, and nothing is hung or stacked as it should be. Make sure you are stacking boxes (though not so high that they become hazardous, and always with the heaviest items on the bottom), and utilize wall-mounted racks for things like garden equipment. Shelving in a storage unit goes a long way. Simple plastic shelving units can add metres more usable space to your unit. Instead of purchasing something with more floor space, consider trying to expand your use of vertical space, and save yourself some money. Be careful not to overload shelves, however. Many people think that a storage unit implies boxes upon boxes upon boxes. While boxing things up is often necessary, don’t box what you can hang. For instance, if you are storing things like a wedding gowns or large pieces of fabric (carpets, rugs, etc. ), consider purchasing a garment rack and garment bags that you can hang, instead of using a box that will take up valuable floor space. A storage unit can feel like a claustrophobic nightmare if there is no clear path from the back to the front. When packing your unit, always make sure there is a clear path you can use when transporting items in and out. It will make your self storage experience much more enjoyable. A self storage unit is what you make of it. A small space well utilized can be much more effective than a larger space, poorly utilized. Keep in mind the above space maximization techniques that you can do all on your own, and get the most out of your self storage investment.